There are several stories about how this month was named. According to one story, May was named for Maia, the Roman goddess of spring and growth (seen above on an amphora painted in 500BC). Another story has it that may is short for majores, a Latin word that means older men. Some people think that the Romans held May sacred to older men and that June was sacred to the juniores, or younger men. People living in England long ago called this month Thrimilce. This means to milk three times. At this time of year, there was much new grass. Cows had more to eat and gave more milk. So they could be milked three times a day, instead of twice. In years gone by, there were many traditions relating to the month of May. In the Catholic Church, May is dedicated to The Virgin Mary. Most households marked this special month by setting up what was known as The May Altar, in honour of Mary. Vases of flowers would be arranged around the Statue of Mary, and usually a night light or candles would burn throughout the days of May. This Altar held a prominent position in the home, and classrooms in schools always set up altars in the same manner. The seasonal flowers were carried to school by the children, and I have a particular memory of masses of bluebells. In Galway City and the outlying areas, people made visits to local grottos dedicated to Our Lady. Castlegar and Menlo were two places of great devotion, and many people walked or cycled to these grottos and said their prayers before going to work or school in the mornings. It was a very common remark to hear that someone was doing the Grotto. I wonder are there many people still carrying out this tradition? People also participated in processions in honour of Our Lady, these took place within the Church or within the Church grounds. Every Sunday in May, in the Augustinian Church in Middle Street, the Statue of Our Lady was carried in procession, followed by the local children dressed in their First Holy Communion clothes. The service consisted of Rosary and Benediction, followed by the procession during which hymns in honour of our Lady were sung by the congregation. It was a lovely tradition and such a pity to see all of this dying out. Perhaps the above will stir up some memories among the older people of the Parish and it may be of interest to some of the younger generation. Is your birthday in May? If so, perhaps you share your birthday with someone important. 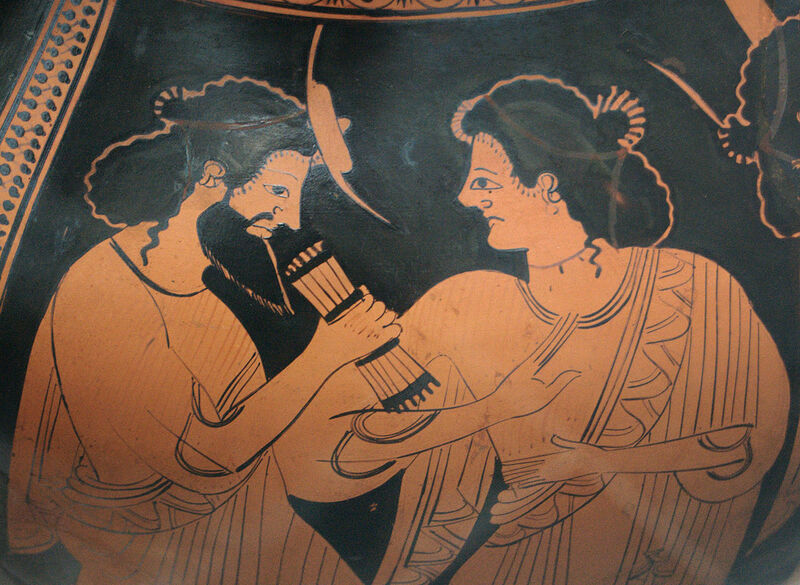 Hermes and Maia, detail from an Attic red-figure amphora (ca. 500 BC).